An RV is not an inexpensive way to travel. "We never have to get a hotel!" you'll hear owners say. Well, they're not wrong. But they do have to carry a hotel everywhere they go, and incur the cost of doing so. Class A RVs like the Storm here cost about a hundred grand new. After paying tax, title, registration, and insurance you've also got to maintain and feed it to the tune of 200-gallon fuel fill-ups, water purging, poop-tank emptying, and so forth. Point is; you don't get into RVs for the cheap and easy vagabond life. That's used Chevy Astro stuff. You get into it for the culture. When my colleagues and I wedged our forty-something foot command center (codenamed JALOP-1) into a row of other semi self-sufficient mobile party pads, we had no clue how to hook up the vehicle to the city water, how to empty our poop tanks, or the degree to which level-ground parking is essential. We also couldn't be bothered to read the manual, but thankfully our neighbors (and I do mean all of them) were literally thrilled at the prospect of helping us bumble our way through our first RV experience. Folks were giving us tips on how to park, how to manage the machine's many intimidating levers, and what to do when our septic tanks were full. I mention that again because the disaster-level of an overflowing poop bowl cannot be overstated. Then they invited us to their rigs for beer and barbecue. Thanks again, y'all! I've always raised an eyebrow when someone talks about how much fun they had hanging out at a campground full of RV pilots, but they might be on to something– the community, at least the slice we got to see of it, is amazingly accommodating and really a lot of fun. Wait, wait... no. That's not even close. I was just re-reading Travis' V12 Vantage review to cheer myself up after looking at this; brickliest of bricks, so friggin' straight and boxy it makes a G-Wagen look like, well, a Ford Expedition at least. But don't forget about that subtle attempt at streamlining up front. Recognize those headlights? Fresh off a Lexus RX300, baby! The body graphics actually do a lot to break up the monotony of the side panels. I've never really studied the sheetmetal of a machine like this, but one big blank billboard of monotone lumbering down the highway would look even less delicate. In the context of cars, it pretty much blows everything out of the water. I mean, it's got a shower, shitter, kitchen, bedroom, couch that turns into a bed, TV, and bonus bed that retracts from atop the driving compartment. Your Miata got that? Unfortunately, you can't use any of those things while the RV is in motion. At least you're not meant to; as far as the law's concerned occupants have to be seated and belted while the rig's rolling (though I've heard not everyone adheres to this rule). When the RV is parked; the area behind the couch and the bed in the way-back extend at the touch of a button to give you more living space, the difference makes the bus-shaped apartment feel a lot more homey, actually. Speaking of button-touching, everything is power-operated. The stairs retract automatically when the door shuts. The awning swings out like a submarine-sized bird is stretching one wing at the flick of a switch. There are more little motors in this motorhome than there are in an R/C hobby store. With the exception of throwing down wood planks to set your leveling-jacks on (also power-retractable) and connecting to a campground's facilities you can go from parked to party mode without burning one beer's worth of calories. As a home, dwelling, hang-out space, whatever you want to call it– the vibe and style is more "on-campus college apartment" than "distinguished living quarters." Cabinets look like your wacky aunt's house before the renovation, seating is fresh out of Bob's Discount Furniture, and frankly the build-quality tying everything together is pretty weak. For example; the nylon screws holding the plastic-and-vinyl expanse that make up the dashboard weren't all in straight. I wasn't necessarily expecting perfection; but if you're going to put exposed screw heads on the dash they really can't be drilled in at a random angle. This was my bed for the weekend, pretty much the same level of luxury I enjoyed while visiting my friends frat houses in the "good old days." At this point the $100,000 price tag starts feeling a little ambitious. A Ford gasoline V10 huffs and puffs and drinks gas stations dry getting this machine from point to point. Acceleration pace is gentle, but not unacceptable. Over 65 MPH fuel economy drops to something like 5 MPG; so said the company rep to my boss Mr. Matt Hardigree. A fair amount of these machines are diesel, I'm told, but at least a few of them aren't. 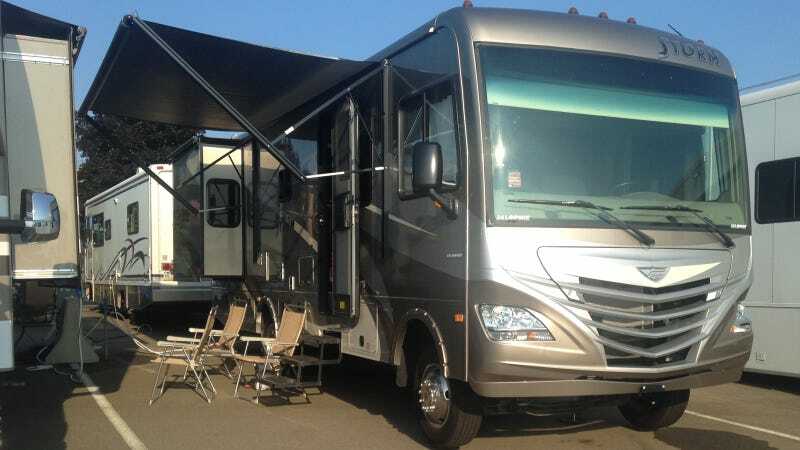 I think you'd be nuts not to sacrifice power for a little extra efficiency when you're planning on covering the crazy mileage people seem to do in RVs. The frame on this thing looks like it was banged out by a high-school shop class. In fact, I think I think I used the same type of square stock in Mr. Corley's "Fabrication Technology 101" my senior year. That's relevant because despite having what looks like two feet of travel, the Storm managed to feel firm and floaty all at once. Hit a pothole and you'll be calling for a structural integrity alarm, go around a corner and you'll quickly loose track of where the wheels are. Note: suspension shown with the vehicle jacked up. I don't think this is a comment on the Storm specifically so much as the general architecture of the Class A RV. There's simply so much weight, so much space, such insanely awful aerodynamics, and the driving experience just can't get that pleasant. Did I mention you need to white-knuckle the wheel when a semi-truck passes you, because the wave of wind hits you with the force of a wrecking ball? You do, it does. Is this where... the poop goes? I've driven a pretty broad range of vehicles at this point, including boxy race support rigs and off-road overlanders based on commercial vehicles. But the Storm stands as one of the most stressful and mentally taxing machines I've operated. Like a lot of things; every mile does get a little easier. But relinquishing the captain's chair and getting back into a pickup truck after about 100 miles at the helm of this was nothing short of relieving. RVs this size seem such a bear to drive and so expensive to run, I'm still having trouble understanding the appeal of the Class A verses buying a decent luxury sedan to travel between hotels with. However, I can absolutely get behind the tailgate-style "Camp Party" that pops up any time you get a few of these things rafted together. Our man Jason Torchinsky might be on to something with the smaller-scale mobile living plan. His little Dodge should give him plenty of opportunities to enjoy the pleasures of trailer-park partying without the inconvenience of trying to maneuver a billboard around gas stations.